Digital Archaeology is a project that seeks to document the formative years of digital culture and raise the profile of digital preservation. Its main focus is 64 Bits, an exhibition that celebrates the golden age of the website, showcasing classic sites on the hardware and software of their day. Unveiled in London as part of Internet Week Europe 2010, the exhibition brings together a selection of the most significant sites of their time, each pushing the boundaries of how we work, play, shop, interact and participate in society. 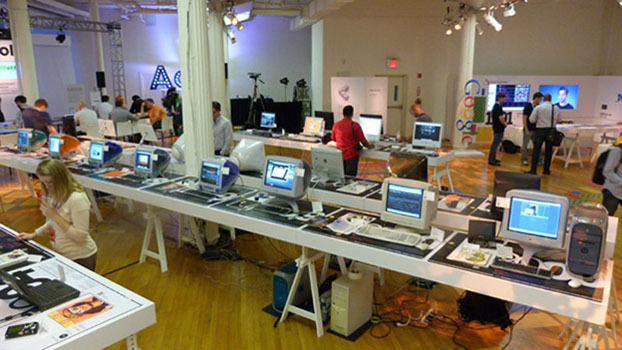 In 2011, Digital Archaeology attracted more than 12,000 visitors at Internet Week New York, gaining sponsorship from Google and with a keynote presentation by The Library of Congress. A capsule version of the show, focusing on the work of influential agencies based in East London, was put on as part of Digital Shoreditch 2013. The exhibition was visited by a team from CERN responsible for restoring the first website and documenting early browsing experiences. Digital Archaeology features as a key part of a larger exhibition, called Digital Revolution debuting at The Barbican in 2014 and now showing in Beijing. The exhibition has been covered by the BBC, the Guardian, the Daily Mirror, the Wall Street Journal, the New Scientist, Wired, Fox News, Reuters, CNN, NPR, Fast Company, Time Out, ReadWriteWeb, the Next Web and around 300 other news organisations. It was shortlisted for a 2012 Digital Preservation Award by the Digital Preservation Coalition. Take a look at some of the video interviews from the exhibition on the Digital Archaeology YouTube channel.